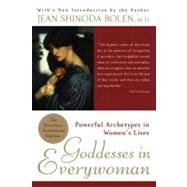 A classic work of female psychology that uses seven archetypcal goddesses as a way of describing behavior patterns and personality traits is being introduced to the next generation of readers with a new introduction by the author.Psychoanalyst Jean Bolen's career soared in the early 1980s when Goddesses in Everywoman was published. Thousands of women readers became fascinated with identifying their own inner goddesses and using these archetypes to guide themselves to greater selfesteem, creativity, and happiness.Bolen's radical idea was that just as women used to be unconscious of the powerful effects that cultural stereotypes had on them, they were also unconscious of powerful archetypal forces within them that influence what they do and how they feel, and which account for major differences among them. Bolen believes that an understanding of these inner patterns and their interrelationships offers reassuring, truetolife alternatives that take women far beyond such restrictive dichotomies as masculine/feminine, mother/lover, careerist/housewife. And she demonstrates in this book how understanding them can provide the key to selfknowledge and wholeness.Dr. Bolen introduced these patterns in the guise of seven archetypal goddesses, or personality types, with whom all women could identify, from the autonomous Artemis and the cool Athena to the nurturing Demeter and the creative Aphrodite, and explains how to decide which to cultivate and which to overcome, and how to tap the power of these enduring archetypes to become a better "heroine" in one's own life story. 13. Which Goddess Gets the Golden Apple? A fragile baby girl was put in my friend Ann's arms, a "blue baby" with a congenital heart defect. Ann was emotionally moved as she held the small infant and looked at her face. She also felt a deep ache in the center of her chest under her breast bone (or sternum). Within moments, she and that baby had forged a bond. After that, Ann visited the child regularly, maintaining contact as long as it was possible. The infant did not survive open-heart surgery. She lived for only a few months, yet she made a profound impression on Ann. At that first meeting, she touched an inner image imbued with emotion that lay deep within Ann's psyche. In 1966, Anthony Stevens, a psychiatrist and author, studied attachment bonds in infancy at the Metera Babies Centre, near Athens, Greece. What he observed happening between nurses and these orphaned infants paralleled Ann's experience. He found that a special bond was formed between a baby and a specific nurse through mutual delight and attraction, a process that was like failing in love. Stevens's observations belie the "cupboard love theory," which postulates that bonds gradually form between a mother and a child through caretaking and feeding. He found that no less than a third of the infants became attached to nurses who had done little or no routine caretaking of the child before the bond formed. Afterward, the nurse invariably did much more for the child, usually because she came to reciprocate the attachment but also because the child would often refuse to be tended by any other nurse when "his" nurse was in the vicinity. Some new mothers experience an immediate attachment to their newborn; a fiercely protective love and deep tenderness toward this infant wells up in them as they hold the precious, helpless baby to whom they have just given birth. We say that the baby evokes the mother archetype in such women. For other new mothers, however, maternal love grows over a period of months, becoming obvious by the time the baby is eight or nine months old. When having a baby does not activate "the mother" in a woman, the woman usually knows that she isn't feeling something other mothers feel, or something she herself has felt for another child. The child misses a vital connection when "the mother" archetype isn't activated, and keeps yearning for it to occur. (Although, as happened with nurses at the Greek orphanage, the archetypal mother-child pattern can be fulfilled through a woman who is not the biological mother.) And yearning for that missed attachment can continue into adulthood. One forty-nine-year-old woman, who was in a women's group with me, wept as she spoke of her mother's death, because now that her mother was dead that hoped-for connection could never develop. Just as "the mother" is a deeply felt way of being that a child can activate in a woman, so also each child is "programmed" to seek "the mother." In both mother and child (and therefore in all humans), an image of mother is associated with maternal behavior and emotion. This inner image at work in the psyche -- an image that determines behavior and emotional responses unconsciously -- is an archetype. "The Mother" is only one of many archetypes -- or latent, internally determined roles -- that can become activated in a woman. When we recognize the different archetypes, we can see more clearly what is acting in us and in others. In this book, I will be introducing archetypes that are active in women's psyches and that are personified as Greek goddesses. For example, Demeter, the maternal goddess, is an embodiment of the mother archetype. The others are Persephone (the daughter), Hera (the wife), Aphrodite (the lover), Artemis (the sister and competitor), Athena (the strategist), and Hestia (the hearthkeeper). As names for archetypes, of course, the goddesses are helpful only when the images fit the woman's feelings, for archetypes do not really have names. C. G. Jung introduced the concept of archetypes into psychology. He saw archetypes as patterns of instinctual behavior that were contained in a collective unconscious. The collective unconscious is the part of the unconscious that is not individual but universal, with contents and modes of behavior that are more or less the same everywhere and in all individuals. Myths and fairytales are expressions of archetypes, as are images and themes in dreams. The presence of common archetypal patterns in all people accounts for similarities in the mythologies of many different cultures. As preexistent patterns, they influence how we behave and how we react to others. Most of us were taught about the gods and goddesses of Mt. Olympus at some time in school and have seen statues and paintings of them, The Romans worshipped these same deities, addressing them by their Latin names. The Olympians had very human attributes: their behavior, emotional reactions, appearance, and mythology provide us with patterns that parallel human behavior andattitudes. They are also familiar to us because they are archetypal; that is, they represent models of being and behaving we recognize from the collective unconscious we all share. The most famous of them were the Twelve Olympians: six gods, Zeus, Poseidon, Hades, Apollo, Ares, Hephaestus, and six goddesses, Hestia, Demeter, Hera, Artemis, Athena, and Aphrodite. One of the twelve, Hestia (Goddess of the Hearth) was replaced by Dionysus (God of Wine), thus changing the male/female balance to seven gods and five goddesses. The goddess archetypes I am describing in this book are the six Olympian goddesses -- Hestia, Demeter, Hera, Artemis, Athena, and Aphrodite -- plus Persephone, whose mythology is inseparable from Demeter's. Powerful Archetypes in Women's Lives. Copyright © by Jean Bolen. Reprinted by permission of HarperCollins Publishers, Inc. All rights reserved. Available now wherever books are sold.